Leukemia Cup Fund Raising – Help Cure Blood Cancers! Fund Raising Sign-up continues this Tuesday night at the December AYC General Membership meeting. 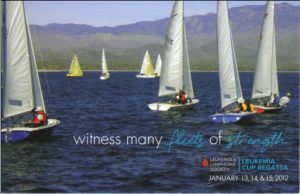 Our Desert Mountain States (DMS) Leukemia Lymphoma Society (LLS) partners will be on hand to register sailors for Leukemia Cup Regatta Fund Raising….and chances to win cool prizes. If you can’t make the meeting, contact Tiffanie Hawkins at DMS/LLS to get your Fund Raising web site up and running! And also, if you have loot for the LCR auction on January 14th, ballgame tickets, time-shares, art, sports memorabilia, even a bottle of rum – they’re all worth silver and gold and will help us in our cause to Cure Blood Cancers! Click here to contact Katherine Motil, or call her at (480) 967-6990 and she’ll keep it safe until the Birthday Regatta. Commodore’s Corner – December 2011 – Great Fall Season!